NBRC Credentialed Practitioners: We are proud to dedicate this special section of our website just to you. 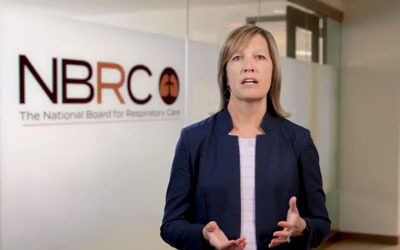 Ensuring your continued competence requires keeping current with best practices and new developments in the field of respiratory care, and the NBRC is here to support you every step of the way. Click or tap on a topic below for detailed guidance. Allow 7-10 days for processing mailed requests and two days for online requests. In addition to these time frames, please allow 5-7 business days for US mail delivery. Option 1: Provide proof of completion of 30 or more hours of Category I Continuing Education directly related to respiratory therapy or pulmonary function technology. Acceptable educational activities include lectures, panels, workshops, seminars, symposiums and distance education). You can submit and track your CEUs with ease using our online portal. At the NBRC, we intend for the completion of CE credit to coordinate with the requirements of state licensure agencies, which means you can use the same CE hours to satisfy requirements for the state as well as NBRC continuing competency. 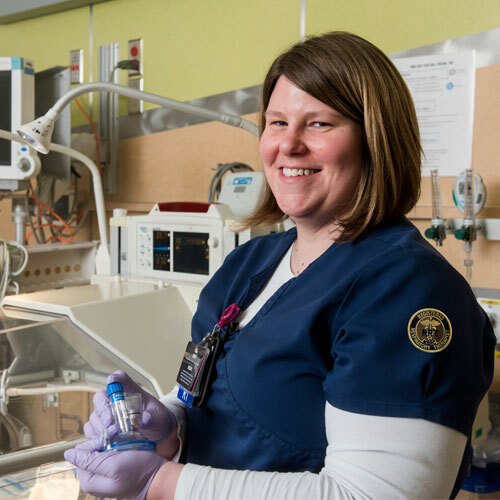 You may also use credits from the American Association for Respiratory Care Continuing Respiratory Care Education Program (AARC-CRCE®) to fulfill the NBRC Continuing Competency Program requirements. Option 2: Retake and pass the respective examination for the highest credential held that is subject to the Continuing Competency Program. You may retake an examination any time during your five-year credential period. A new five-year period will begin on the date you successfully pass the examination. If you hold multiple credentials from the NBRC and elect to maintain your credentials through the examination option, you must successfully complete the examination for the highest level credential held that is subject to the Continuing Competency Program. Option 3: Pass an NBRC credentialing examination not previously completed to automatically extend the recredentialing period of all other NBRC credentials you hold for an additional five years (starting when you earn a new NBRC credential). As a result, all your NBRC credentials will have the same expiration date, allowing you to maintain all credentials simultaneously in the future. The Continuing Competency Program is not retroactive, and therefore, this program does not affect credentials achieved before July 1, 2002. For example, if you earned your NBRC credentials before July 1, 2002, and then you later passed a different NBRC credentialing examination after July 1, 2002, you would only be required to participate in the Continuing Competency Program for the credential achieved on or after July 1, 2002. What is the Continuing Competency Program? When you earned your badge of distinction by successfully completing your credentialing examination, you received active NBRC status for the remainder of that calendar year. We encourage you to set a goal for renewing your active status every year. We want to make your experience with the NBRC as seamless and smooth as possible. One way we do this is by providing secure access to our portal for credentialed practitioners. Watch: You have your NBRC credential....now what? You have your credentials, now what? 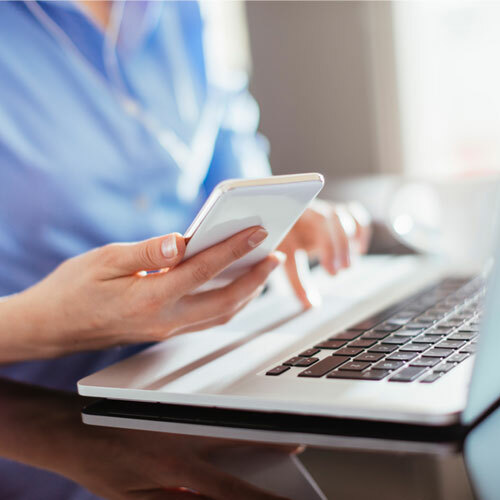 As a credentialed practitioner, you have access to the Directory of Credentialed Practitioners, which allows you to search for credentialed colleagues across the country. 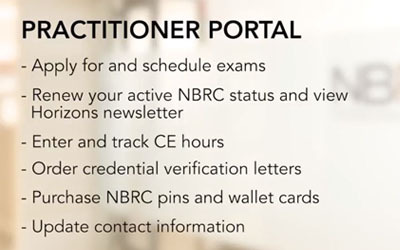 Through our Practitioner Portal, you can order pins, wallet cards and replacement certificates available exclusively to NBRC credentialed practitioners. 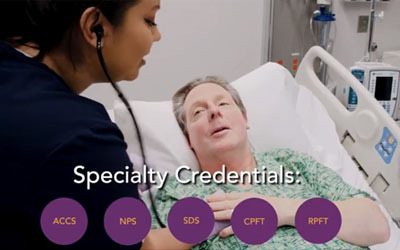 Specialty credentialing helps you maintain control over your career, signaling to employers and colleagues that your skills are highly specialized and your knowledge and expertise is current in multiple areas of respiratory care. Becoming a respiratory care practitioner with specialty credentials can help you attain better jobs with higher salaries at higher quality institutions. NBRC credentialed practitioners become eligible to apply for specialty credential examinations three months to one year after earning the RRT or CRT credential (actual time frames vary by current credential and desired specialty credential). 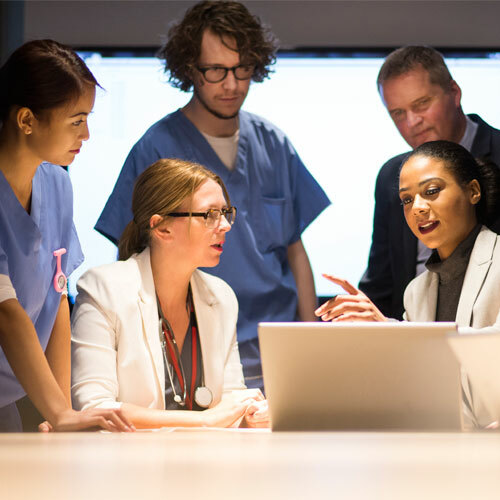 We developed the Candidate Handbook to help you apply and prepare for NBRC credentialing examinations, including specialty credentialing exams. The Candidate Handbook contains the NBRC’s admissions and examination policies, applications for testing, and other important information about the content of the respective examinations. These materials in no way substitute for a thorough education or your commitment to study, but they can help you increase your confidence and ability to perform well on the examinations.